My color bearer was first struck down, when his comrade seized the flag, who fell immediately. A third took it and shared the same fate; then Capt. Benjamin Robinson, of Company A, carried it until the staff had shivered to pieces in his hands. Although it is easy to believe a color-bearer would be mortally wounded—the flags made them easy and enticing targets, it is hard to imagine that a fallen color-bearer would be left holding the flag long enough for the blood to congeal, gluing the flag to his hands. Nevertheless, it made a terrific opening case for the doctors and nurses of Mansion House Hospital. Says a correspondent of the New York Tribune: A few moments ago I saw the color bearer of the 10th New York carried into the Mansion House Hospital. He was wounded in three different parts of the body—one wound in the thigh was a terrible one—but he still clung to his colors and would not allow them to be taken from him. As he was being taken up the steps, he became insensible and an effort was made to take the flag from him, but his clutch—his hand seemed like a grasp of iron—his hand seemed glued with his own blood to the stars and stripes. Brave and noble fellow! Burst involuntarily from surgeons and bystanders. roll of our heroes. He received three terrible wounds in a recent engagement, but clung to his colors with tenacious grasp. While being taken into the hospital he became insensible, and an attempt was made to take the flag away, but his unconscious hand held it more powerfully; even then his ruling passion was strong. Such men in life and death are glorious examples. The color-bearer mentioned may have been 29-year-old Sergeant Albion Alexander, who during the Battle of Second Bull Run saved the 10th New York’s colors from certain capture and was wounded in the process. As an audience member at last night’s viewing party pointed out, the image of the young flag-bearer still holding the colors, the national colors literally glued to his hand by his own blood and the blood of his comrades-in-arms—including his dead father, is a perfect image of what motivated many of these soldiers: love of country, love of comrades, and sacrifice. 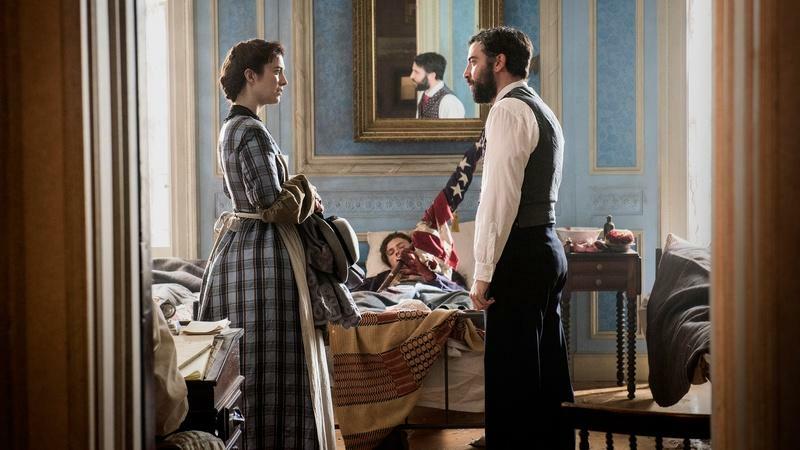 As a storytelling technique alone, the image of the dying flag-bearer was a powerful one and a compelling way to introduce the series and a new audience to the Civil War. The fact that it is a true story makes it even more powerful. Amelia Grabowski is the Outreach and Education Coordinator at the National Museum of Civil War Medicine and the Clara Barton Missing Soldiers Office Museum. She has a Master’s Degree in Public Humanities and Cultural Heritage from Brown University, where she received the Master’s Award for Engaged Citizenship and Community Service. Amelia has worked for the Lower East Side Tenement Museum, the Bullock Texas State History Museum, humanities councils, and community organizations: all endeavoring to connect the past to the present in engaging and creative ways. Learn more about the young men who joined up, including the youngest and most famous soldier, nine year old Johnny Clem. Flip through this photo-essay, and come face to face with the child-soldiers of the Civil War.